There are probably more delightful names for initiatives. There are probably more enticing names for channels. But for what it is, #beeftweets works for us. Because it is a channel full of tweets that are beefs, and it causes a considerable amount of delight, both inside this team, and out. Let us explain. First, you’ll need to know about the Reacji Channeler. 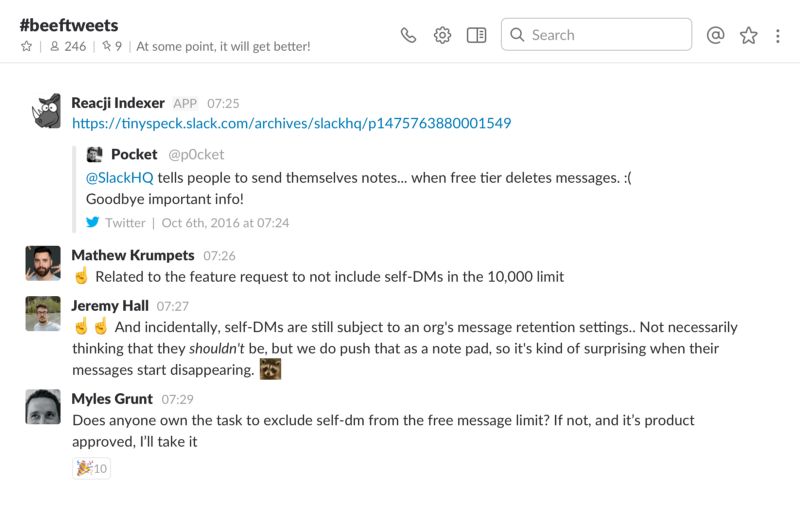 This made-by-Slack tool is an installable app that allows you to move messages quickly from one channel to another, by using emoji reactions. You can read more about it here. In that post, we gave a few simple examples of how it could be used. This post is the story of how we use it for a particular workflow inside our own team that helps us improve Slack. We have a channel where we can watch every tweet coming into — and out from — SlackHQ. Not everyone can be watching that, of course — it’s a very busy channel, and there’s a lot of work to do. But it’s a good place to go when you want to see reactions to a new feature, or gauge the temperature of how people are feeling about Slack. Intriguing issues crop up there, and we realized we could use it more efficiently for the power of good. And once we started using the Reacji Channeler internally, that became a lot easier. We’ve always collected nice things people say to us on Twitter. We gather them in a channel called #lovetweets. It’s pretty heartwarming. But it’s not the whole picture. Basically, it isn’t bugs — we deal with those appropriately, reporting them if they’ve not been reported, and fixing them. It isn’t feature requests — there’s a whole other channel for that. And it’s not complaints about features or issues that we’re already working on. We’ve talked about our philosophy around small features more on our engineering blog, but in this case, it’s the things that we’ve missed. The rough edges that need to be smoothed. The hidden corners that we forgot to paint. Things that — without taking resources or time away from the bigger features that people are waiting for — we can fix quickly. And we have been, frequently turning things around in less than a day. Someone in our #slackhq channel sees a good beeftweet. They consider the criteria described above. The tweet (or ticket, we also do this with help tickets) automatically shows up in the#beeftweets channel. In a thread below the tweet, people discuss how it can be fixed. If it’s something known to already be part of planned work (or something just that’s not going to happen for whatever reason), it’s marked with a red X so people scrolling through know it’s been discounted and not to bother joining the thread. If it’s decided something can be done to fix it without impacting other work, it can be assigned to a team straight from #beeftweets. A particular plant emoji will send it to #growth-team for them to discuss, a custom octopus emoji will send it to #core-ideas for that team to deal with, etc. If an individual is taking it, they might have an emoji of their avatar that sends things to a channel just for them. The thing gets done, and then launched. Usually within a couple of days. That’s the point of small beefs. And sometimes, if we can, we respond back to the original tweeter so they know we’re listening. There are two things we hope you take away from reading this post. First, there are a million and one different ways you can put the Reacji Channeler to work. It doesn’t have to be for triaging customer tweets or delegating which team works on what — we left it purposefully open so you can use it however you please. Second, never hesitate before sending what seems like a silly annoyance to @SlackHQ thinking “this won’t make a difference”. Because it just might. It might, in fact, be a perfect beeftweet.